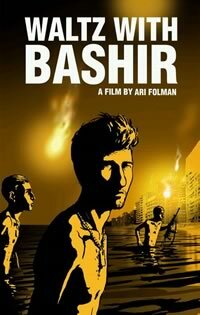 Waltz with Bashir is a 2008 Israeli animated documentary film written and directed by Ari Folman. The film was conceived as a journey in search of Folman's lost memories from the 1982 Lebanon War. Told from the point of view of Folman himself, it is a brutally honest exploration of the reliability of memory and the long-term impact of violence on young soldiers. Enjoy a 10% discount on food and beverages (excluding alcoholic beverages) at Kelsey's upon presentation of a valid MNM movie ticket/stub or Subscription Pass. Offer valid only on MNM film nights. The Film Circuit, a division of the Toronto International Film Festival Group, gratefully acknowledges the following supporters for their commitment to celebrating excellence in film: Global, Foreign Affairs Canada, Ontario Media Development Corp., Bell, Volkswagen, Warner Brothers, Cineplex Entertainment, Mackenzie Investments, Zip.ca. Special thanks to AV Preservation Trust Ca. and Sleeman Brewing & Malting Co. Ltd.